Scientists at Duke University have connected the brains of three rhesus macaque monkeys, allowing the primates to combine their mental efforts into manipulating virtual objects that they could not affect individually. 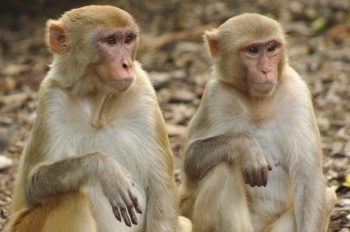 Scientists have managed to build a rudimentary "hive-mind" by connecting the brains of several rhesus macaque monkeys. This achievement is exactly as Borg-like as it sounds. This is the second Star-Trek-esque technology revealed in as many weeks. Bring on the transporter beam! The monkeys had been previously trained to use brain interfaces to manipulate a three-dimensional, virtual arm on a screen. When three of the animals were linked together, each was given control over two of the three axes of motion. Working together, they were able to effectively control the arm - reaching a for a virtual ball - in a way none of them could do on their own. Check out the study in more detail here. Though the monkeys were not directly wired to each other, their brain patterns began to complement each others', becoming far more efficient. When one of the monkeys was distracted by something outside of the test, the other two were able to quickly adapt to its absence, and complete the experiment. The same scientists had previously wired rat brains together. In experiments, they could prove that sensations delivered to one of the paired rats could be felt by the other. Lead scientists, Miguel Nicolelis, has previously been a pioneer of brain-machine interfaces that allow amputees to manipulate robotic arms. He hopes his latest experiments will lead to building "organic computers" - a network of living, animal brains working together in a gestalt consciousness. He is dismissive of comparisons to the Borg, Cybermen, and other sci-fi bogey-men: "We're conditioned by Hollywood and movies to think that everything related to science is dangerous and scary. These scary scenarios crossed my mind, and I'm the one doing the experiments." See more new technology at The Escapist. Nicolelis has a point. Technology itself is not evil; the evil is in how it's used. Like any other scientific advancement, this particular achievement could be used either for good or for bad - it just so happens that "hive-mind"-style devices never seem to work out too well in our favorite stories. "Why do you resist?" echoed Three-of-Four, an unaffiliated researcher. "Lower your shields," he continued, before elaborating on the futility of resistance. Nicolelis went on to enumerate the possible benefits of the technology - brain rehabilitation, such as after a stroke or injury, for example. He does not believe we will keep ourselves plugged-in, though. He also pointed out that it was unlikely we would ever share complex mental experiences using these interfaces. "You're not going to share your emotions or personality to a brain-net," he said. "These are not reducible to a digital algorithm. You can't reproduce these individual human attributes." Three-of-Four was quick to reply that there was really no need for emotions or personality. "Let alone individual human attributes," he said, gesturing air quotes with his tiny wrench fingers. 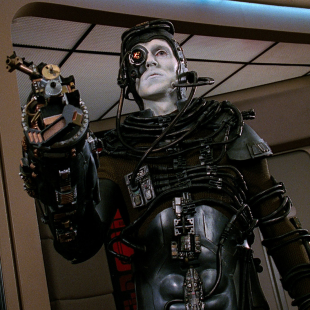 "You will be assimilated," he added.